This is the view from my trailer door into the dressing room. 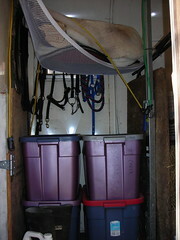 I used to have my saddle pads sitting on top of the Rubbermaid boxes. That was a big pain to deal with anytime I wanted anything out of the boxes. Daniel and I solved the problem by buying a large PetNet and stringing it up. Now my pads are nicely suspended above the boxes and I even have room to put two more boxes if I need them.